Click here to check out our variety of Tank Cleaners and Adjuvants! Nutriculture 20-20-20 General Purpose Fertilizer is formulated as a general purpose, water soluble feed for use on ornamental plants, small shrubs, grasses, fruits and vegetables, and other intensely cultivated crops. In addition to N-P-K it also contains a minor element complex of boron, copper, Iron, manganese, molybdenum, zinc, and sulfur. Nutriculture’s Mag-Iron is an effective, water soluble source of Magnesium and Iron which is essential for the growth and development of all plants. MAG-IRON aids in absorption and translocation of phosphorus, increasing the yield and quality of the crop. TotalTree® contains slow release nitrogen, chelated iron, mycorrhizae, and biostimulants. It is the arborists complete long-term fertilization system. Enviro-Green *L 18-0-6 is a foliar fertilizer containing a 50:50 ratio of SRN from triazone and urea, formulated to meet the plants immediate and longer term nitrogen needs. Maxi Cal is designed to provide calcium in a clean, nearly dust-free way. Calcium is used by plants to enhance nutrient uptake and create strong cell walls. Maxi Cal S has the same great capsulated design that creates clean and dust free application. This blend helps to neatralize soil pH. Capsulated Gypsum pellets are pH neatral and will either not effect or lower the pH in soils. This formula aids in reducing compaction and restores sodium affected soils. Capsulated High Calcium Limestone Pellets help to neatralize acidic soil conditions, providing an optimum range for nutrient uptake. 16-45-7 Seed Starter Special is designed as a water soluble starter solution which promotes faster seed germination and root development on seeds and transplants, without burning. It will promote faster germination time by as much as 40% depending on species. ProScape ® 18-0-5 25% MESA® .09 Dimension® contains a selective herbicide that provides control of many annual grasses and broadleaf weeds (see bag label for a complete list) in established lawns and ornamental turfs, including golf course fairways, roughs, and tee boxes. ProScape® 19-0-6 33% MESA® Confront® 3 & Dimension® contains MESA® for extended feeding. This product provides for the post-emergence control of annual and perennial broadleaf weeds, and pre-emergence control of annual grassy weeds and labeled broadleaf weeds (see label for a complete list), in established ornamental turf, lawns, golf courses, roadsides and cemeteries. Green View’s 11-23-10 Seed Starting Fertilizer plus Crabgrass Preventer is perfect for newly seeded lawns. It prevents crabgrass while promoting turf seed germination. EC Grow’s Award 19-0-6 Fertilizer with Dimension 0.1% is a premium balanced fertilizer with crabgrass control designed for use by landscape professionals, lawn services and nurseries. Award 22-0-5 Professional Turf Fertilizer with 1% Fe and Trimec is designed to provide a boost of nutrition for turf as well as great post-emergent, broadleaf weed control for a large variety of broadleaf weeds. Perfect Blend Biotic Fertilizers are a great addition to any organic or organically based plant health system. Through patented processes, their specially formulated fertilizers provide well balanced, essential nutrients, along with mycorrhizae spores to enhance the general health of turf and other plant life. This high quality fertilizer is designed to provide accessible nutrients to turf and other plants while maintaining a balanced pH level. The stable and homogenized solution helps to build the complex molecular structure and aid in the efficiency in the fulvic and humic acids. Perfect Blend 16-3-7 is a perfect addition to any turf fertility program. This fertilizer provides 13 essential nutrients for plant health including a variety of nitrogen sources for quick and long lasting effects. This organic, slow release fertilizer is designed to meet your lawn’s needs for macro nutrients, micro nutrients and mycorrhizae spores for enhanced nutrient uptake. This organically based lawn food includes 14 essential elements and mycorrhizae spores for optimal lawn health. Because of its natural base Perfect Blend 8-4-2 is designed to provide necessary components to rejuvenate and restore synthetically fertilized lawns. As it is a naturally stable fertilizer, it is safe to use near lakes and streams. Perfect Blend 8-4-5 is designed to supply soil microbes with high quality, organically based nutrition in order to aid in breaking down minerals needed in general plant health. The addition of Mycorrhizal spores increases the valuable nutrient uptake. Milorganiteis a great organic, nitrogen rich, and cost effective fertilizer. Over 85% of the nitrogen in Milorganite is in a slow release form, which means that plants access the nutrients when they need them. The gentle action of this fertilizer ensures no burning even with over-application and strong green growth rather than excessive growth produced by other fertilizers. 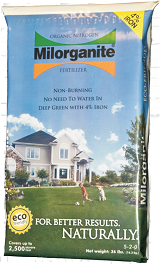 Milorganite is a popular product for home owners, turf professionals and golf course managers. Non-burning, long-lasting, eco-friendly fertilizer adds non-staining iron and available non-leaching phosphorus along with organic matter to enhance your turf for an extended period. This is the same great Milorganite product in a smaller particle size! This is the same great fertilizer product formulated for roughs and fairways! Natur O provides us with a corn gluten product that is both a fertilizer as well as a weed suppressant. This natural product helps to keep weeds down by drying out the seed just after the seed coat cracks open and before actual germination takes place while providing an organic source of nitrogen. Even though they are not technically fertilizer, we’ve includedproducts from Mycorrhizal Products.com™ on this page because the beneficial effects of these products and how they aid in plant growth. Mycorrhizae are fungi that, when in contact with the roots, form a symbiotic relationship that increases root vigor and growth. They help the plant absorb water and breakdown nutrients which makes the plant more efficient and drought tolerant. Mycorrhizal Products.com TM Granular is a great all purpose formulation. It's particle size lends it to mechanical application systems such as Seed casters, Rot-o-tillers and Mulch spreaders. It is excellent to use on both transplants and existing plants.